Travel 50 kilometres from Cape Town, into the lush valley at the foot of the Stellenbosch, Jonkershoek and Simonsberg Mountains, and you’ll discover the beautiful town of Stellenbosch, South Africa’s second oldest town after Cape Town, renowned for its history, culture, sport, education and of course, its world famous wines. 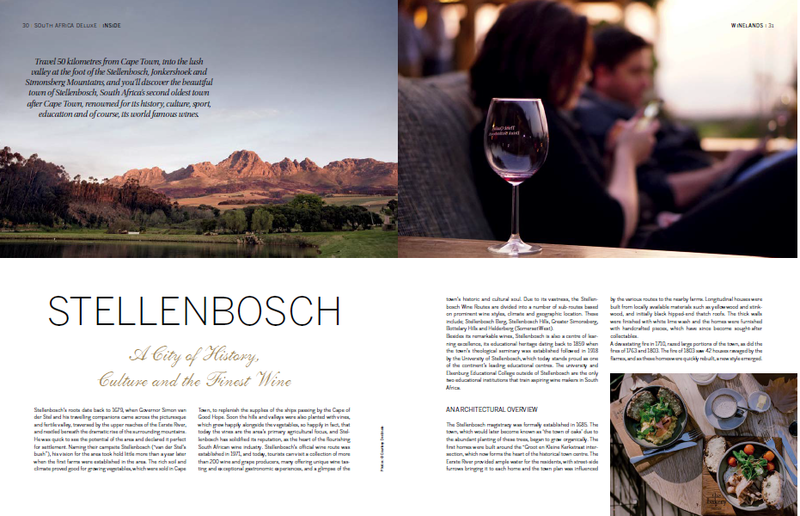 Stellenbosch has much to offer from an artistic and cultural perspective. At the D-Street Gallery at 112 Dorp Street, you will find contemporary art by emerging and established South African artists, while the SMAC Art Gallery on the 1st Floor of the De Wet Centre, on Church Street, offers an eclectic mix of South African and international art. The Rupert Museum on Stellentia Avenue houses what has been called the premier collection of contemporary South African art, from the period 1940 to 1970. It is home to more than 350 works, including the country’s biggest Irma Stern collection. While there are some international works in the collection, the museum’s main focus is on works from renowned local artists such as Alexis Preller, JH Pierneef, Penny Siopis, and Willem Strydom.